People wear earplugs for various reasons. Some of them desire to keep their ears safe from noises. Others want to prevent water from entering their ears during their swimming sessions, while some people desire to keep other things away by using ear plugs. Either way, earplugs are made of wax, silicone, synthetic foam or some other materials and their main purpose is keeping our ears safe from various environmental dangers. There are certain types of earplugs which are specially designed in order to keep water away from your ears. These are mostly used by professional swimmers and people who are into water sports. Made of wax or moldable silicone, these earplugs are bound to keep one's ears well protected whenever he/she spends time in water. Alternatively some types of earplugs are made for keeping sound away from your ears, providing you a form of hearing protection. These are usually created from a special type of synthetic, memory foam which, when inserted into the ear canal, adjusts to the inner shape of the ear and blocks unwanted sounds from reaching it. Alternatively, these can be created from silicone which is placed onto the outer surface of the ear canal, resulting in the same effect. However, most expert musicians opt for flanged earplugs, being rated as Hi-Fi, custom made in most cases. Thus, most musicians have their earplugs custom-made, fitting their ears perfect and allowing them to hear the music they are playing, without getting exposed to noises which can damage their hearing. These earplugs are usually much more expensive than the usual disposable ones which can be purchased over-the-counter. However, custom-made earplugs are made to be used more than once, being a long-term investment. Some professional skiers may desire noise-reducing earplugs in order to keep their ears safe from the sound of the wind against their helmet. On the other hand, some people may need earplugs so that they can sleep peacefully. For these purposes, the earplugs are created for specific uses, allowing the wearer to feel comfortable while enjoying the effect of noise removal. People who commonly experience pain in their ears due to airplane cabin pressure during their flights are advised to use specially designed ear plugs for these situations too. Most models of earplugs are considered to be perfectly safe. Nevertheless, you should be careful when using these products since mishandling may lead to problems. Namely, pushing the earplugs deep into the ear canal may increase the air pressure in the area, resulting in pain and increased discomfort. If the pain is felt, you are advised to take the earplugs out, compress them and gently insert them again, so that they fit you properly. Since the pain may appear due to the negative pressure when pulling the earplugs out, it is best to screw or jiggle them out. When the earplug is pushed too close to the eardrum, it may push the earwax or some debris found in the ear against it. Thus, in order to avoid this, you are advised to keep the earplugs inserted deep enough to grab them and remove them easily. Finally, in some cases, a person may be allergic to the materials the earplugs are made of and this may trigger an adverse reaction in the organism. As it was mentioned above, custom-made earplugs are commonly intended for long-term use and are not disposed of after a single session. Due to these factors, these earplugs are usually made of gentle materials which do not damage the skin and do not reach the delicate parts of the ear canal. Regardless, wearing these earplugs in the long run may prove to have certain health risks as well. The long-term earplugs may lead to excessive accumulation of earwax and debris inside the ear, possibly leading to the occurrence of tinnitus, hearing loss, ear discharge, pain or infections in the area. In order to avoid this, keep the ear and the earplug clean. Also, in time, these earplugs may irritate the temporomandibular joint, being near to the ear canal, resulting in pain, or trigger inflammations by trapping the bacteria and other harmful microorganisms inside the ear. Finally, a study carried out in 2003, published in Clinical Otolaryngology, showed that making a combination of cotton ball and petroleum jelly presents an alternative which is more user-friendly and more comfortable than regular earplugs. As for the hearing preservation earplugs, these should be worn for protecting a person from noise since a 85dB noise, without adequate protection, can be withstood for no longer than 8 continuous hours. If the noise is 91dB, the maximal recommended time of exposure is 2 hours. Furthermore, if the noise reaches 97dB, you should keep your exposure limited for 30 minutes. Ultimately, 7 minutes is the limit of exposure once you listen to 103dB noise. All in all, various types of earplugs exist and all of these have both positive and negative sides. 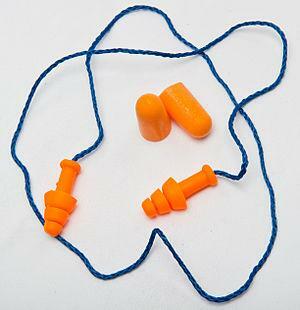 When used properly, earplugs can be very beneficial in many different situations, keeping you healthy and safe. What Causes Persistent Noises Inside The Ear?